"Weave house," a proposed conceptual design of the refugee camps Project Archi-new - Free Dwg file Blocks Cad autocad architecture. Archi-new 3D Dwg - Free Dwg file Blocks Cad autocad architecture. Inspired by the traditional weave and flexible snake skin basketry techniques and designed the architectural Canadian Jordanian Abeer Seikaly develop a practical and elegant solution at the same time need to secure shelters lightweight and portable and structurally stable solution is used in post-disaster. Does not believe in the project "weave house," winner in the contest design 2013 Lexus Design Awards flexible and viable shelter for transport and by; but also includes a compilation of the water and Toleda Solar is gently solar water, using resistant fabric water-tight between the plastic pipe bending and reluctance. Which creates a structurally stable tent can withstand pressure and tensile loads. Also, this double layered cloth hollow allowing the extension of Okbal extension of water and electricity between classes. Modular design allows for a tent as well as open holes where required to allow hot air to leave and enter the cold breeze, as tents that can completely shut down in the event of cold weather and rainy. Seikaly has its project with the participation of the Arab News Portal architecture within the framework of the initiative launched by the gate under the title "rebuild destroyed towns" and that when asked about how do you see the role of the architect in the rebuilding of the destroyed? Abeer Seikaly gate told that "humans define themselves through their environment built-being plays an important role in the formation of identity and human memory. The buildings existing and destruction and its absence in addition to the rebuilt constitute identity, and when destroyed buildings erased turn memories Assembly. Destroyed some cities by natural disasters while others affected by the war in order to erase the identity and memory in order to establish a restoration of the fabric of urban system that destroys the past and any hope for the future. Kmmarih I will begin by asking questions such as: How new identities shaped by the built environment? Do you ignore the past or keep a portion of the mass to remind us our history as lessons to be learned? How do we re storytelling strongest ways honest? I also I will go as individuals and professionals belonging to several different scientific fields to work within the intellectual design process in order to determine the restructuring of the city and come up with an effective strategy to rebuild. will require an understanding of internal events of the cities, and culture this In addition to the external factors that have affected them. I see it as an opportunity for the development of contemporary thought. " "The longest-threaded nature used to weave their models, so every little piece of fabric reveals the organization of the entire fabric." Richard Feynman Richard P. Feynman. Human life developed through history alternating waves of migration and stability. Thus, the movement of people across the land led to the discovery of new areas as well as the creation of new communities among strangers, which was formed in the end, towns and cities and nations. The research in this duality between discovery and stability, movement and stability, there is a fundamental essence of the matter is that what it means to be human. Over the last century and after the world wars and natural disasters the world has seen the displacement of millions of people across continents. The refugees seeking to find shelter to their new life in the unknown land often those starts without anything but a tent called a house. This project re-examine the traditional architectural concept of movement and mobility during the secure comfort of contemporary life (Kaltdfih, and running water, electricity, storage etc ...). The concept behind the meristem is a tradition that is not bounded by time to weave elements within the forms of light weight and easy to fold into flat surfaces for transfer. Multi-threaded also features the weave several different purposes, for example, a network of windows and storage, solar tissue capable of stretch for Sustainable Energy, which in turn feed the flexible pipes for water, heating and electricity. Meristem works on several scales starting from the aperture scale and even tent city scale, meaning Landscape of domes that serve the community and go up the basic needs required to stay at a place where integrated community and is recovering from his wounds and renew the ambitions. Urbanism weaves Bedouin society physically and figuratively, services and design and functionally beautiful. The Bedouin find in this vacuum transit place to stop for troubled worlds, to a place where the fabric weave their new lives. Disaster temporary and unexpected nature are considered. It hit multiple locations in different ways and for a variety of time periods. The suffixes of mass disasters also vary. Some last for weeks, as in the case of floods, hurricanes, and each lasts for years, as in the case of tsunamis, earthquakes, famines and wars. However, the lack of predictability of disasters has become in recent years, due to the effects of climate change and global instability, very unexpected. Dependent reaction to people who were forced to leave their homes blocks, and sometimes their country, the very old and inefficient design systems in addition to being non-inspiring. Are often shelters complex refugee enough not to be able to build fast enough, and be strict and inflexible to the point where they can not be able to contain the various family sizes and measurements of the various functions (such as the expansion of the home to a medical clinic to the school to the community center) as it lacks the basic necessities of modern life such as heating, running water, sanitation, electricity and internet connection. Refugee camps are often bland and pale lack of natural light and reflect the tragic situation Qatnoha find themselves without the guilt of them. Besides the physical failure suffered by the current refugee camps there is a failure on the social level as well; because when disasters destroyed communities have time to shelters to begin rebuilding the social interaction. Because disasters destroy the existing environments must shelters that turned the rest into something new yet familiar. 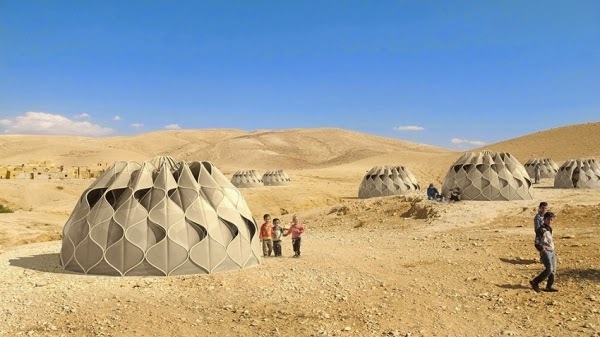 The project proposes a new kind of disaster shelters for refugees depending on the system draws inspiration from the collective past Kalbedwi nomadic tribes traveled across the territory, setting up temporary shelters had been considered the only home. The meristem is inspired by the ancient tradition of weaving and braiding linear membranes within his chair and three-dimensional installations. Recent technical developments have formed the basis for innovation fabric and material and the way the project assembly in order to manufacture a new type of technical textile fabric is easy construction and erection and then disassembly, reuse and change the scale, according to a variety of functions, starting from the basket and the end of the building skin tent built.